Rent it for $265/day ……………………………………………………..
Landscapers! We have added a second ride-on aerator to our rental fleet! Forget about renting 5 small aerators and paying 5 laborers to do the same job that this one unit can handle by itself! 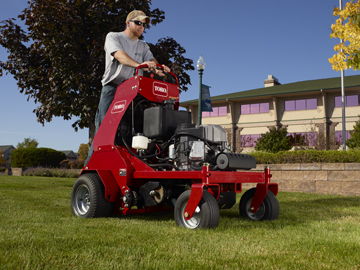 With an aerating width of 30″ combined with a working speed of up to 7.5 mph, this aerator will help you maximize profits by cutting costs in half! !